A concert of Canadian choral music for the 150th anniversary of Confederation. It’s the year of Canada 150 celebration! 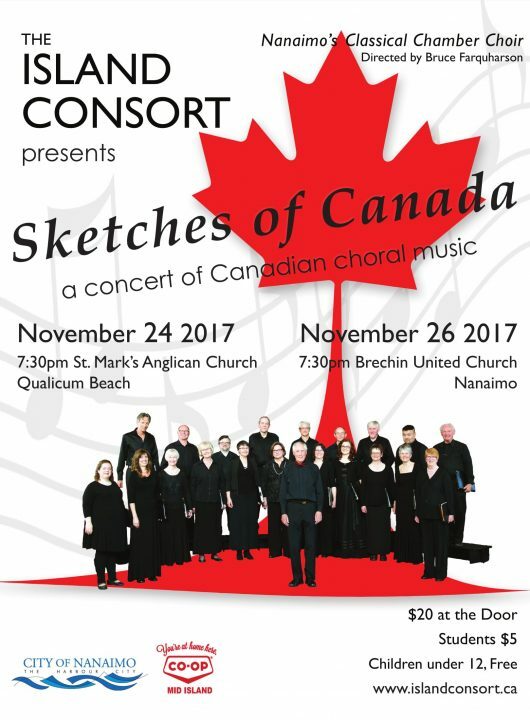 This vast country has a wonderful variety of histories, landscapes and characteristics – and the Island Consort, directed by Bruce Farquharson, will celebrate what it is to be Canadian with a musical pastiche of songs by Canadian composers. The program, “Sketches of Canada” will take us across the country with music from the outports of Newfoundland to songs of fishing and sailing in the Maritimes, to Quebec and Ontario and the prairies, to the 1st Nations of British Columbia. We’ll sing repertoire of the 20th and 21st centuries, from Nova Scotia’s Donald Cook to Quebec’s Donald Patriquin and recent Armenian immigrant, Vahram Sarkissian to Ontario’s Healey Willan to Alberta’s Ian Tyson to Vancouverites, Stephen Chatman, Kathleen Allen and Matthew Emery. We’ll sing of winter sun and rain, of trains and mosquitos and log-rolling, of love and patriotism, and of the Salish and Tsimshian. Piano accompanist will be Sharon Wishart.